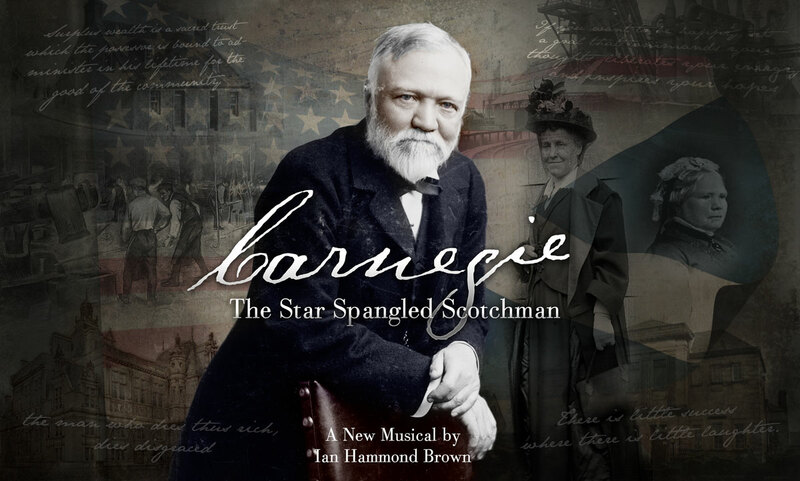 A new musical telling the story of Andrew Carnegie’s life. Born in 1835 in the town of Dunfermline, Scotland he was the son of a poor weaver. The Family emigrated to the USA in 1848 to seek work after the Industrial Revolution created a slump in demand for traditional handmade damask. There he rose from telegraph boy in the Pittsburgh Office of the Ohio Telegraph Company to superintendent of the Pittsburgh Division by age of 18. Through shrewd investments he became a railroad company owner, steel magnate and eventually the richest man in the world after selling his steel company to J.P. Morgan for $480m in 1901. The musical is set in the last few hours of Andrew Carnegie’s life, Peterson, the embodiment of St Peter, brings John, a steelworker killed in the infamous Carnegie Steel Homestead Steel plant dispute of 1892, back from the afterlife to help him hear the story of Carnegie’s life and ultimately decide on Carnegie’s eternal fate. Carnegie tells Peterson his story from being a young man in Dunfermline, through his journey to America, then his early life in Pittsburgh and finally the ruthless deals, intrigue, loves and losses on the journey which lead to him becoming the richest man in the world when he sold his Steel Empire to JP Morgan in 1901 for $480 million. As the story progresses it reveals how he came to understand that someone with so much wealth and power is ultimately only its custodian for future generations. He draws the conclusion that, through strategic philanthropy, he must give his money away for the good of mankind and strives to do this before he dies. His famous quote ‘The Man who dies thus rich dies disgraced’ is the inspiration for today’s great philanthropists such as Bill Gates and Warren Buffett. In the end John, the steelworker, must decide if Carnegie should go to Heaven or Hell, and if he can forgive Carnegie for causing his death. Ian Hammond Brown, who enjoyed critical and box office success with Whisky Galore a Musical! (co-written with Shona McKee McNeil) at Pitlochry Festival Theatre in 2009 and 2011 and was supported by Creative Scotland through an award from the Talent Development Programme, to write book, music and lyrics for this new musical. A reading was successfully staged at the Festival Theatre Edinburgh on 25th Nov 2013. On November 25th 2014 New Musical Theatre Alliance Scotland in association with The Alhambra and Limelight Productions presented Carnegie – A New Musical in concert at the Alhambra Theatre, Dunfermline. A Concert version of the musical will be produced at The Carnegie Hall in Dunfermline on 17th and 18th May 2019.